It has been ten years since I last wore perfume. Why? Because I realized it was just added toxin, and that many people are allergic to perfumes. I was totally happy with my perfume-free life up until last summer, when I suddenly begun to miss having a scent around me. So I went to the perfume sections in stores, sniffing away many beautiful scents, but still considered them mostly as toxins. I could not overcome the thought. Why add toxin straight on to my skin, when just as well I could live without it? It did not make sense. After all our world today is laden with all sorts of poisons we can not escape anyway, why add to that? What else out there smells nice besides common perfumes? Well, essential oils of course! When the thought hit me, I could not stop pondering how to wear them as perfume. Essential oils are so strong that they should not be applied to the bare skin, and they might stain clothes too. It took many loooong moments of thinking before I came up with the solution: earrings. Earrings hang close to the nose, so when aromatic essential oil is added to them, it can be easily sensed. You don´t have to add a ton of it either for the same reason. Ordinary perfume can naturally also be added to earrings, instead of the skin, and thus reduce one´s exposure to daily toxins. How handy is that?! 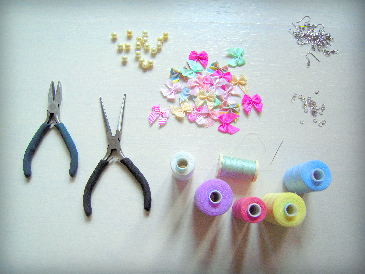 Satin ribbon bows, glass pearls, hooks, loops, pliers, and needle and thread of course. 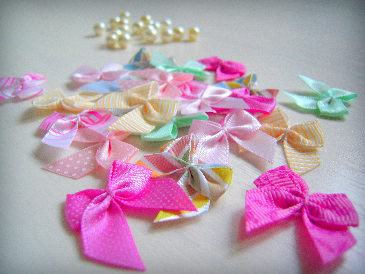 The bows play the main role as the oil absorbing material. 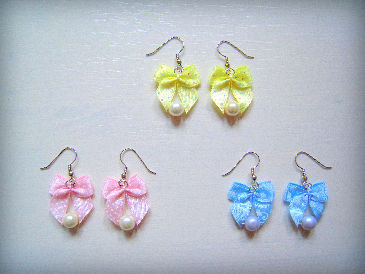 These candy colors are especially delicious for Oestara and spring time overall. The assembly. 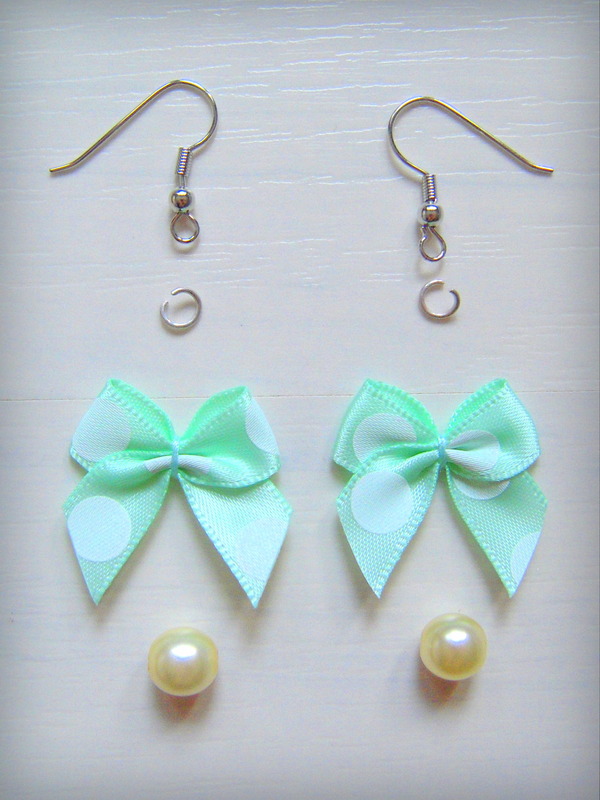 Use the pliers to attach the hooks and loops to the bows, then sew the pearls in place unnoticeably. Choose the colors you adore and have fun! Currently my favorite essential oil is orange. I also love eucalyptus and rose. I like to wear uplifting and happy scents. Essential oils are used in aromatherapy, so if you have ailments of any sort, you can relieve the symptoms by choosing the right oil. Aromatherapy is no longer tied to a certain space, now you can heal and pamper yourself where ever you go, throughout the day! I love it! You can either make a pair of aromatherapy earrings yourself, or take a short cut and get them from me. 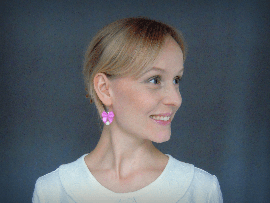 My brand new shop, Nelland Boutique, is now open on Etsy, and I welcome everybody to check out the earrings I´ve made just for you! 100% pretty, durable, and easy to wear. Just the way everyday life should be!